I just bought Ooma Telo and its handset from costco. It was interesting and I'm really excited to own this product. But after went throught the installation, it seems like everything work fine, I see the blue light on the Ooma Telo logo, I can hear the dial tone from my Ooma handset, I can hear the ringtone when Ooma is ringing. But I can hear the voice of the person that I'm calling to. (Cable+Router+Wireless (Netgear)) -> Ooma Telo via LAN Port. I've tried to call Ooma Technical Support for a while, but it seems like no free agent to serve me. Has it been connected to the internet long enough for it to download and install the latest firmware? Look on the handset menu for Information. Select it and tell us what the Version number is. If it's not 32829, it's not up to date and you will have to wait until is. Do not panic if you see the lights start flashing, let it sit until it comes back to all blue lights. Do you know where is the problem is? Do you have a wired phone to plug into the Telo's phone port to test? Those are strange numbers. I am on Comcast and have what I believe is their minimum advertised package. It is 12 down and 2 up. I consistently measure 4 up and 14 to 20 down. The only time that I had low down numbers was when my old modem was overheating. It was a Scientific Atlanta WebSTAR DPC2100. Here are my results via a "g" type wireless link, which is not the best way to do the test. Groundhound wrote: Do you have a wired phone to plug into the Telo's phone port to test? No, I don't. I'm using Ooma Telo handset. Will that be cause the issue? 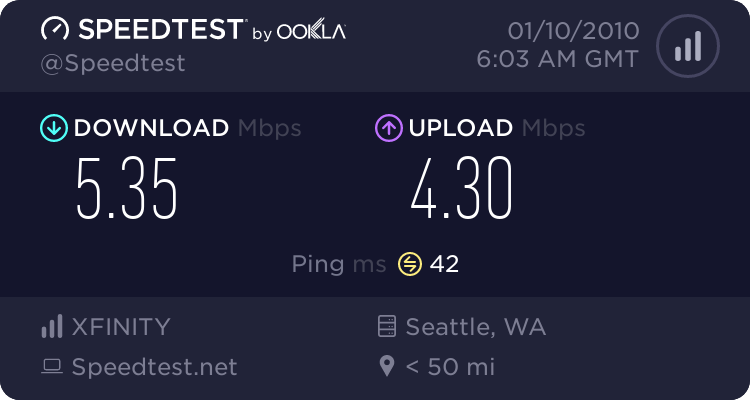 Do you see with 10Mbps cause this issue? Actually I'm trying to find out where's the problem is, since I'm using NetGear CG814WG V2 wireless router, and the Ooma is connected to this router via LAN Port. It would help determine if the problem is with the Telo Handset or not, if you could test on a different phone. I think default is 2. Will that the problem on Ooma handset?